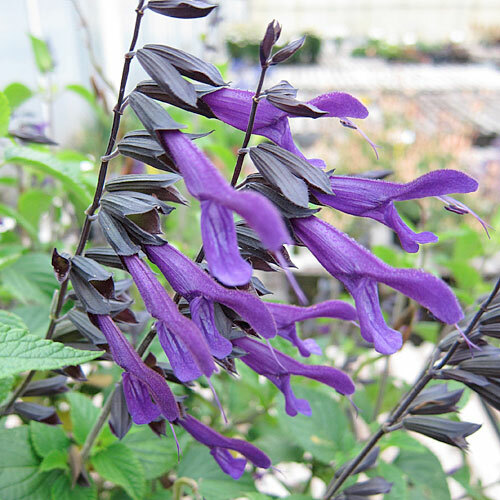 ‘Amistad’ Salvia’s dark purple flowers bloom earlier and rebloom constantly from early spring until frost, without pruning. More compact and with a fuller habit than other guaranitica types, its flowers are a magnet for butterflies, hummingbirds, and other pollinators. 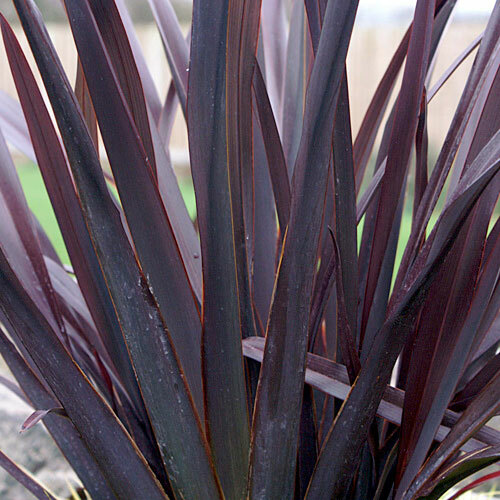 ‘Black Adder’ Phormium’s dramatic burgundy foliage holds its color year-round and stays under 4 feet tall. Drought and heat tolerant, it’s great in mixed borders, containers, and can even be planted as a hedge. Protect from frost in colder climates. 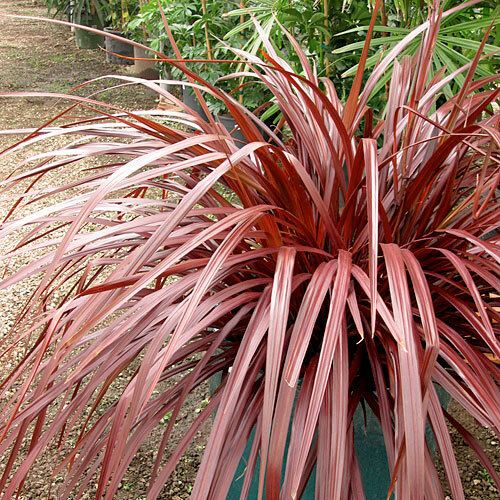 Cordyline’s unique cascading grass-like habit is ideal for containers on patios, along walls and walkways, or as accent plants in mixed borders. This low-maintenance plant provides rich, burgundy color all year and works great with succulents. Ceanothus is a West Coast native, prized for its summer drought tolerance and ability to cover a slope with zero maintenance. ‘Diamond Heights’ combines these qualities with brilliant golden yellow and bright green foliage for year-round interest. Everillo wins our best plant for brightening up shady spots, or for adding a pop of color to a mixed container. This easy care evergreen grass can be used as a groundcover, to edge a path or patio, or tucked into a living wall or window box. 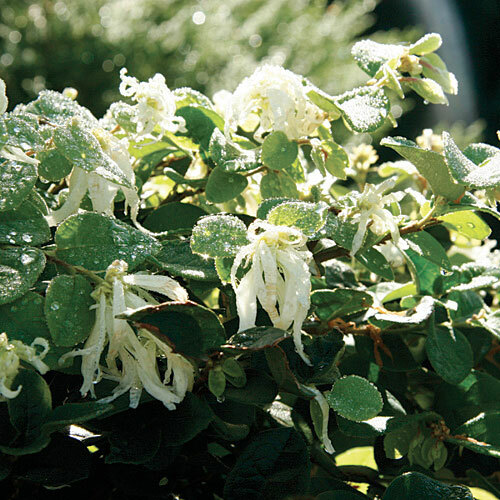 Looking for a dwarf, easy care, evergreen shrub that flowers and provides year-long color? 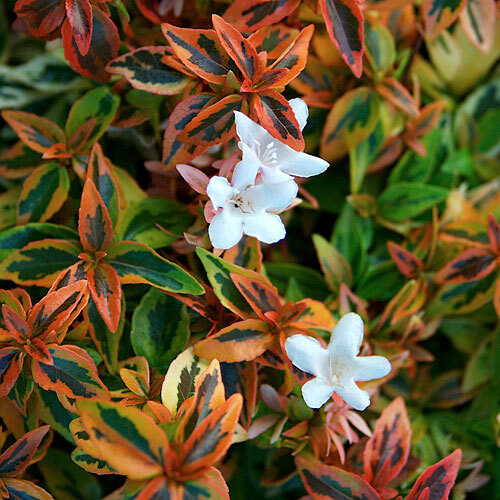 ‘Kaleidoscope’ Abelia is as versatile as it is colorful, with chameleon-like foliage that changes with the seasons from golden yellow in spring to orange-red in fall. More: and these great pairs. 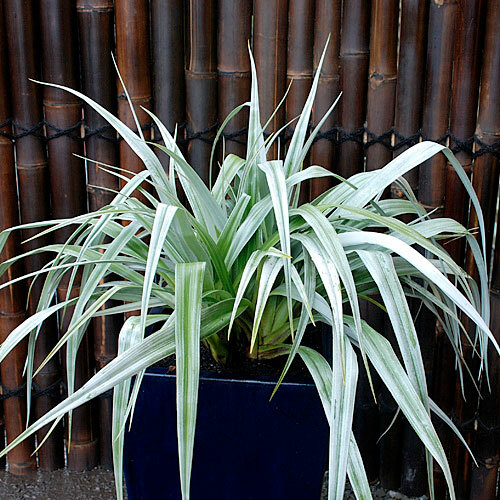 ‘Silver Shadow’ Compact Astelia’s bold strappy silver foliage adds height to container gardens and succulent plantings. Can be used or overwintered as an indoor plant in bright indirect light. ‘Soft Caress’ has everything we love about Mahonia, without the pesky thorns! Compact enough to use in containers, yet large enough for foundation plantings, they provide fabulous texture to the shade garden. Mojo® Pittosporum is the perfect easy care shrub! Excellent as a container plant, mass planted as ground or slope cover, as a low hedge, or as an accent plant in borders. Year-round foliage can also be used in cut arrangements and wreaths. More: accent in the garden. This sport of ‘Firepower’ has unique blush-colored young foliage from spring until fall, then turns to deep red over winter. Blush Pink makes the perfect short hedge or color accent to evergreen shrubs. Its dense low growth habit is perfect for any garden or mixed container. Chef’s Choice® Rosemary is an outstanding new rosemary specially selected for its higher oil content and spicy flavor. 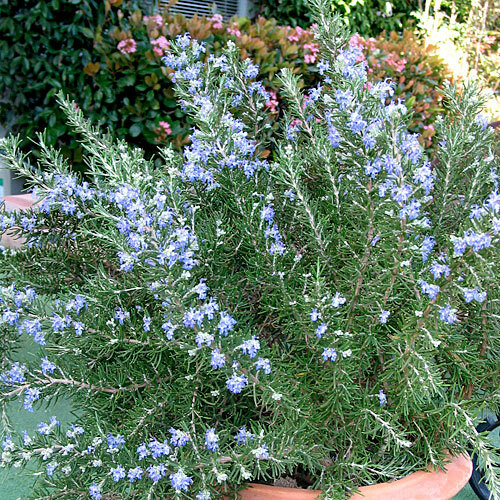 With a compact, mounding habit, this is the rosemary of choice for container, herb, and kitchen gardens. Loropetalums have a naturally elegant, layered habit that works beautifully in any landscape or container garden. By selecting a dwarf variety like Emerald Snow®, you can give your shears a rest, and never worry about pruning again. More: will grow in your garden. The award-winning ‘Orange Rocket’ barberry sports a unique color combination for an easy care shrub. 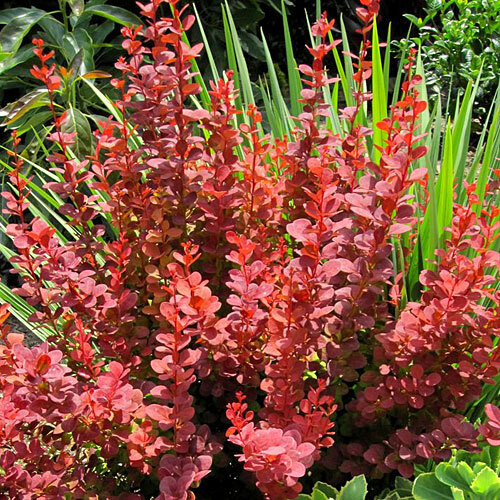 New spring foliage starts out a vibrant coral, ages to mid green, then turns ruby red for fall. Useful as a vertical element in borders, landscapes, or containers. More: than ‘Orange Rocket’ Berberis. Stunning deep red new growth from spring until fall accentuates the evergreen leaves of this nandina. Unlike similar varieties, Flirt holds its superior red color through the summer. Space 2 inches apart for groundcover or low hedge. Perfect in mixed beds and containers. More: that’s not so green. Tropical Gardenia fragrance on a cold hardy, evergreen, easy care plant. 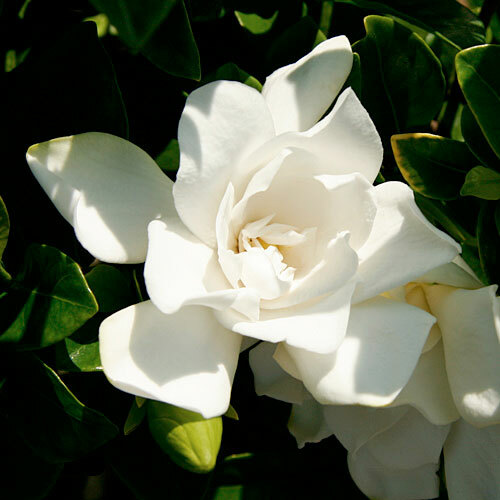 Jubilation™ Gardenia flowers heavily from spring through fall with masses of white blooms. Plant near patios, porches, decks, and other outdoor living areas where the fragrance can be enjoyed. 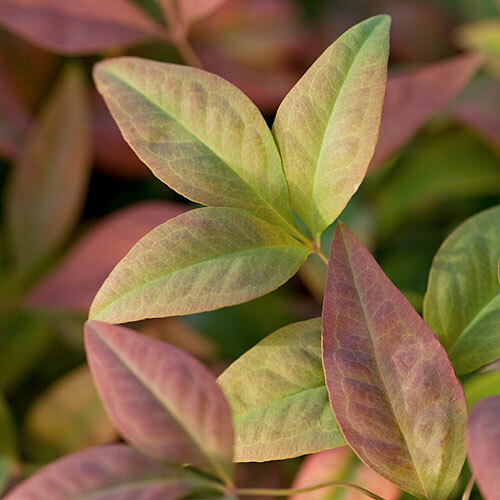 This new and distinctive nandina is a selection of ‘GulfStream’ with brighter and longer-lasting foliage color. ‘Obsession’ has a dense growth habit and brilliant red new foliage all spring and summer. We love Cistus. Poor soil, drought, salt, wind, and heat…They take it all. Add deer, pest, and fire resistance, what’s not to love? This new charmer stays compact without pruning, and even looks great when not in bloom. Works well as a border plant, or in containers. More: cover the plant in spring and can attract honeybees. 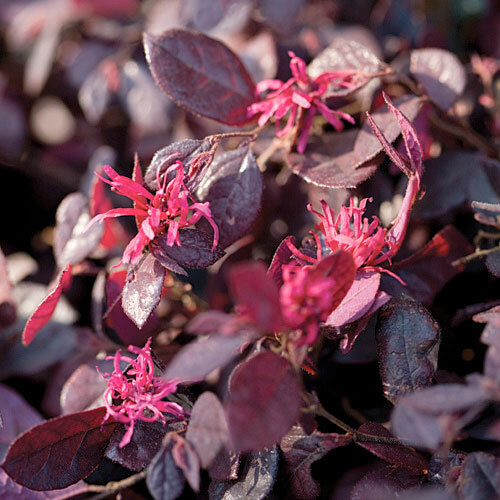 Combining colorful flowers with year-round deep purple foliage, Purple Diamond® Loropetalum holds its purple color better than others. Its compact habit is useful as an accent shrub in borders, a foundation plant, low hedge, or in mass plantings. First ground cover Loropetalum! 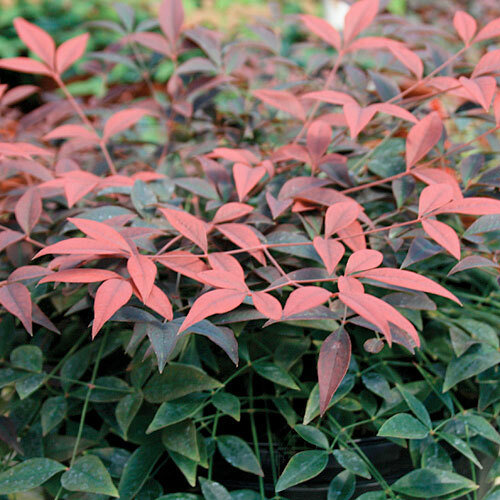 Easy to grow, low maintenance dwarf shrub holds rich purple foliage year round. Purple Pixie® is great in mass plantings, on slopes or cascading over retaining walls. Adds vibrant color spilling over containers and hanging baskets. An outstanding abelia with bright variegated foliage that starts yellow with green centers when young, then matures to ivory and green. 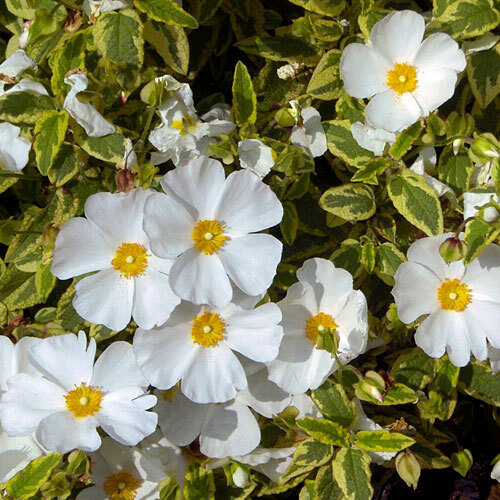 Produces a heavy bloom of white flowers for summer and fall. Buxus are a staple plant for edging, hedging, and topiary. Baby Gem is very compact, and will need much less pruning than others, making it ideal for lower hedges and containers. Branches can be used as cut foliage in arrangements or wreaths. Dianella are the ultimate easy care plants. This tough new hybrid gets strong upright Phormium-like growth from one parent and deep blue color from the other. Plays well with succulents, and makes a great container plant. Every now and then a new plant comes along that is perfect for our Western climates. Foxglove was crossed with a shrubby Isoplexis, which resulted in a perennial re-blooming apricot-orange garden wonder. Hybrid between Fatsia japonica and English ivy, these plants got the best of both parents. Giant ivy leaves provide color in darker locations, but will not root into stucco or spread where it isn’t wanted. Stems will need to be staked or supported. Can be used indoors. More: has a habit perfectly suited to espalier. Most Festucas lose their blue color over the summer, but not Beyond Blue. This versatile grass tolerates cold, heat, humidity, drought, and poor soils. More: with these unique evergreen plants. This compact plant holds its shape and its blooms don’t fade. It produces heavy blooms early spring to fall and requires little water. Lavender allardii are the most heat-tolerant and water-wise lavenders we grow. 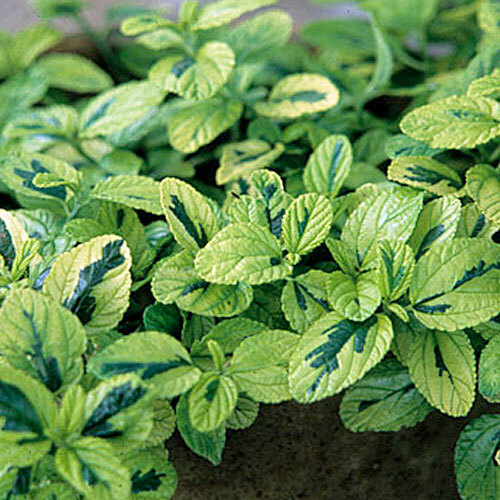 These vigorous plants hold their beautifully variegated and highly fragrant foliage. They also sport pale, blue flowers in summer. Dry leaves for sachets and moth repellent. How did a ligustrum make it into the Pulaukotok Collection? We are always on the lookout for easy care, colorful, water-wise, non-invasive garden solutions. This tough plant is so versatile we keep finding new places to use it. 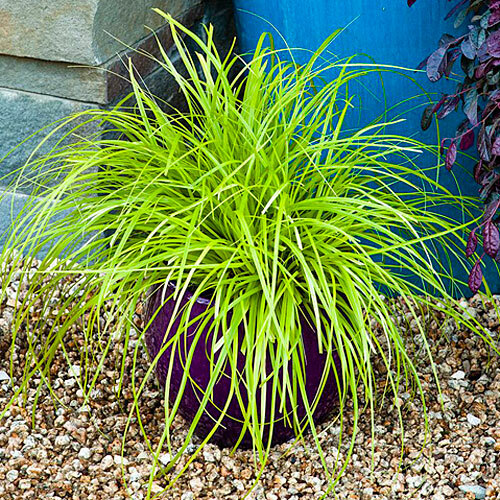 Lomandras look like grasses, but they’re actually tough, low-water perennials. ‘Platinum Beauty’ is the first green-and-white striped variegated form, and looks great with succulents and other low-water use plants. This new, compact loropetalum has the reddest blooms of all cultivars. 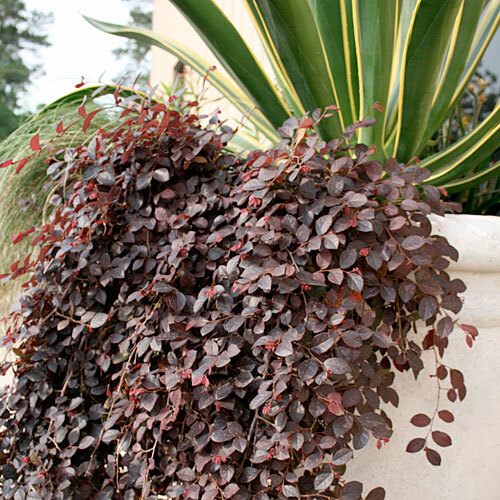 Dark burgundy foliage retains its color throughout the year. Great for specimen planting, mass plantings and borders. 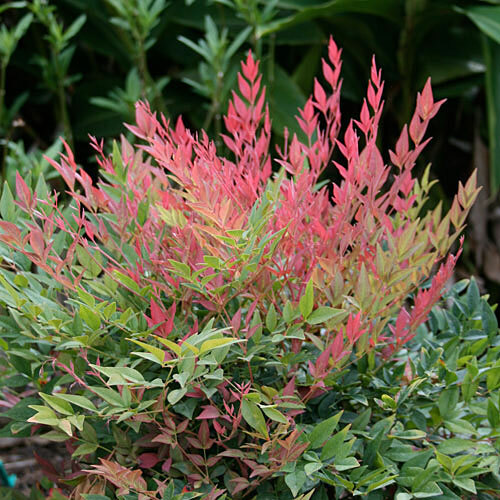 Finally, a Nandina for those of you who don’t want red in your gardens! Lemon Lime has chartreuse new foliage that fades to a nice green, and won’t turn red, even over the winter. Twist of Pink’s deep pink blooms and creamy white variegated foliage—plus its resistance to drought, heat and salt—make it the perfect plant for a more aggressive climate. Elegant in foliage and form, Pieris’ are good companions for azaleas and loropetalums. More: with Mountain Snow Pieris. Deep purple flowers cover these tough plants from early spring to frost. Like its cousin, Wendy’s Wish Salvia, this Salvia will form a ball of color in your yard, with no pruning or deadheading. A portion of plant proceeds go to Make-A-Wish. More: Love and Wishes Salvia. Better behaved than Salvia ‘Hot Lips’, ‘Little Kiss’ remains dense and compact at only 18. Salvia microphylla is native to the American Southwest, and it’s a fabulous perennial shrub choice for dryer climates. ‘Killer Cranberry’ has masses of rich magenta flowers to lure honeybees and hummingbirds to your garden. Plus, it’s got a superior glossy foliage. Glowing coral flowers cover these tough plants from early spring to frost. Her blooms won’t fade in the heat, forming a ball of color in your yard with no pruning or deadheading. A portion of plant proceeds go to Make-A-Wish. An improved earlier blooming version of Black and Blue. Another great Salvia option for the mid to back of borders. Deer-resistant and heavy blooming until frost. Until recently, tecomas grew huge, bloomed only in late spring and fall, and were covered in unattractive seed pods. Lydia stays more compact and blooms bright yellow flowers from early spring until frost. While some tecomas grow to gigantic sizes, Bells of Fire is bred to be more compact. Enjoy its tropical appearance and flower power. A charming selection, Rainbow Sensation will brighten your garden with its attractive, variegated foliage. Dense clusters of soft pink, funnel-shaped flowers bloom in profusion in May as hummingbirds flock to harvest the sweet nectar.